on occasion of the beginning of the Chinese Revolution, the Comintern (SH) sends militant greetings of proletarian internationalism to you, the brave protectors and standard bearers of the great historical battles of the armed Chinese working class. On this day we will remember all Chinese comrades who sacrificed their life for the revolution. 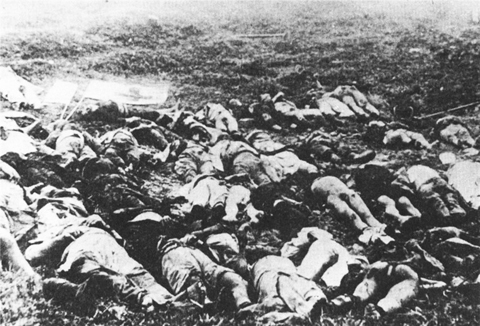 The blood-bath perpetrated by the counter-revolution will never be forgotten. The responsibility for their blood rests on the international gangs of murderers of the bourgeois-capitalist governments of all imperialist Powers. 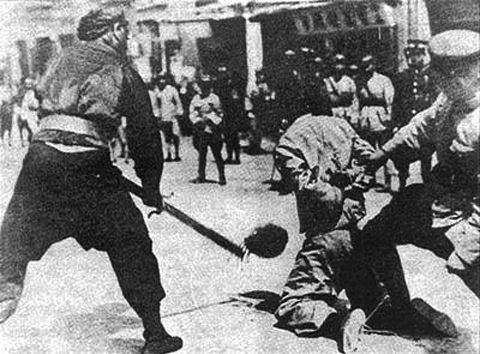 The disarming and shooting down of workers organized by the latest hangman of the Chinese revolution, the treacherous general Chiang Kai-shek are links in one chain, forged by the imperialists of all countries. And in spite of all hardships and sacrifices, the Chinese workers established the armed dictatorship of the proletariat - at least locally for several hours. 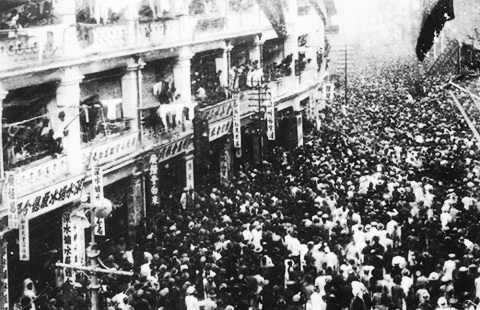 Although the Chinese Revolution ended with a defeat, the Chinese proletariat proved impressively that the worldwide triumphal march of the October Revolution is unstoppable. "The theses on the national and colonial question drawn up by Lenin and adopted at the second congress of the Comintern still have full validity. 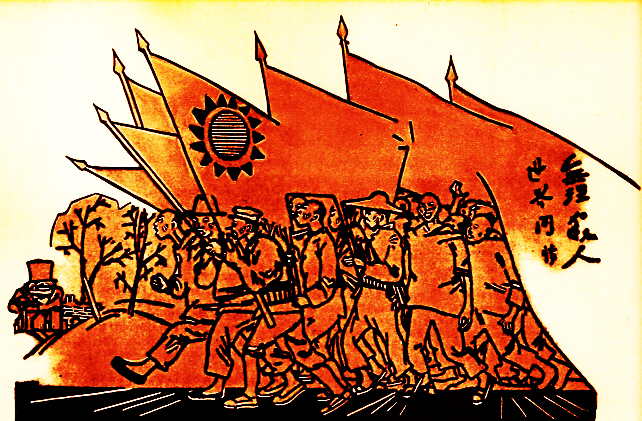 The last powerful onslaught of the revolutionary waves was the insurrection of the heroic Canton proletariat under the slogan of Soviets attempted to link up the agrarian revolution with the overthrow of the Kuomintang and the establishment of the dictatorship of the workers and peasants. 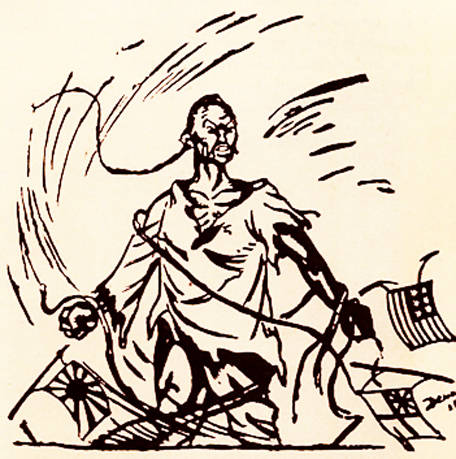 The establishment of a fighting front between the active forces of the socialist world revolution (the Soviet Union and the revolutionary labour movement in the capitalist countries) on the one side, and between the forces of imperialism on the other, is of decisive importance in the present epoch of world history. The labouring masses of the colonies, struggling against imperialist slavery, represent a most powerful auxiliary force of the socialist world revolution. The colonial countries are the most dangerous sector of the imperialist front. The revolutionary liberation movements of the colonies and semi-colonies are rallying to the banner of the Soviet Union, convinced by bitter experience that there is no salvation for them except in alliance with the revolutionary proletariat. 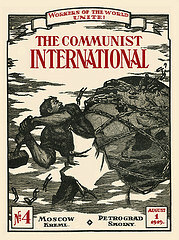 There is thus an objective possibility of a non-capitalist path of development for the backward colonies, the possibility that the bourgeois-democratic revolution in the more advanced colonies will be transformed, with the aid of the victorious proletarian dictatorship in other countries, into the proletarian socialist revolution. In favourable objective conditions, this possibility will be converted into a reality, and the path of development determined by struggle and by struggle alone". (VI Congress of the Comintern). 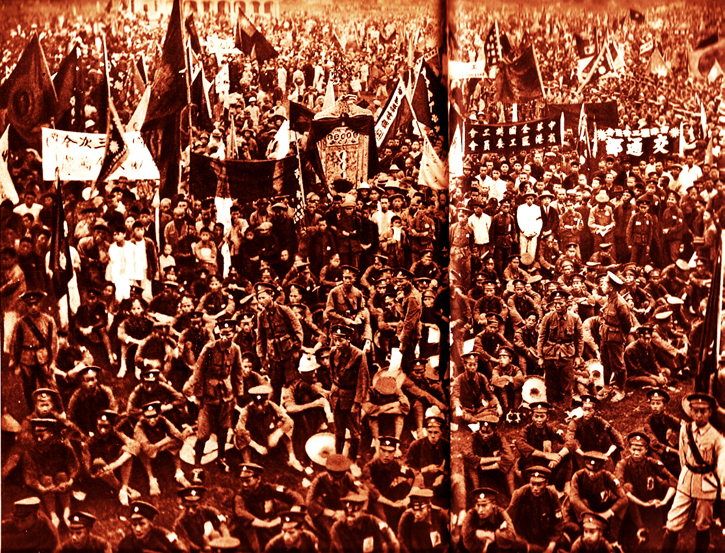 The armed insurrection in Kanton was highlight of the independent struggle of the Chinese proletariat, its hegemonial role of the leading revolutionary class against the bourgeoisie, against the feudal-militarist Cliques and the foreign imperialists. 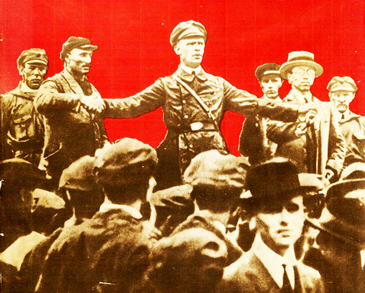 The working class took the lead for the seizure of Chinese Soviet power of the workers, peasants and soldiers – thus the power of hammer, sicle and rifle – for which the Comintern (SH) strives on a global scale. 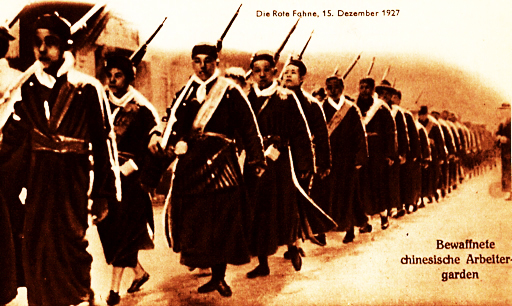 The armed uprisings in Kanton and Shanghai will be forever a great model of the heroism of the Chinese workers in their "own" country, and a great model for the exploited and oppressed working class and toilers all over the world, in general. This is why we are proud to globally celebrate today's great historical event. Even though for a short period of 58 hours, the proletariat of a colonial country, for the first time in history, established decrees for the purpose of the nationalization of land, confication of large companies, means of transport and vehicles, the banks, proclamation of the 8-hour-day, the physical destruction and termination of the counter-revolution, the acknowlegement of trade unions as authorized organs of the working class, the decree for the abolishment of the mercenary army, and last not least, the ruthless struggle against the imperialist brute violence exploitation, oppression and wars. The proletariat of the colonial and semi-colonial countries have practically proved that the dictatorship of the proletariat, also in the colonial and semi-colonial countries, is really an indispensable instrument of the revolutionary transition towards a classless society, and not – as until then – the continuation and maintenance of oppression and exploitation by ruling classes which were replaced by other ruling classes. 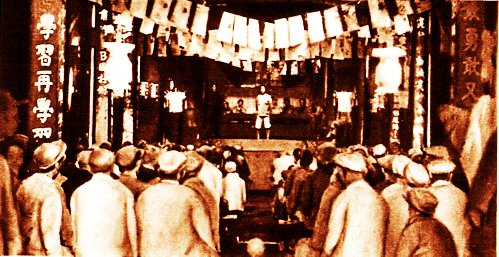 Kanton was the heart of the Chinese Revolution and became the "Asian Center" of the proletarian world revolution. Kanton was the "Paris Commune of the East". The Chinese Revolution became the spearhead of the socialist world revolution in the colonial and semi-colonial countries. The Chinese proletariat was encouraged by the support and solidarity of the Soviet Union of Lenin and Stalin and the whole world proletariat. The Comintern called on all workers, and in the first place on all communists, to fulfil their duty of proletarian solidarity and aid for the heroic Chinese proletariat. 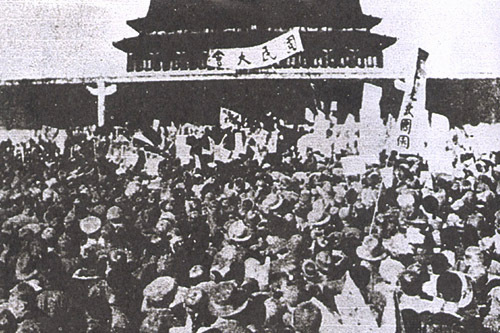 The Chinese Revolution was guided by the Comintern and its Chinese Section, the CP of China, which did not always consequently enough implement the directives of the Comintern. The CP of China took not enough attention of applying correctly to the principles of Marxism-Leninism. 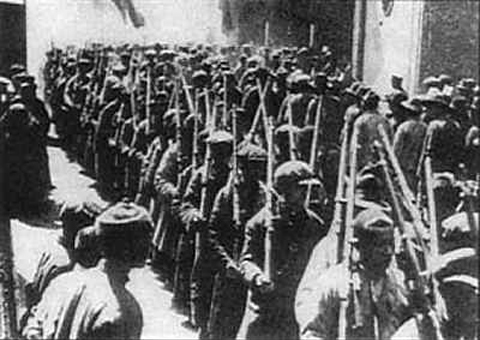 The victorious finals of an armed surrection requires its careful planning (inclusively the well-organized retreat), avoiding of serious military-political errors, convincing the soldiers of the counter-revolutioanry army of turning the rifles, the organized participation of the broad proletarian masses, the integration of allied forces such as the poor peasantry and the progressive elements of the petty-bourgeoisie, the systematic embedding of local uprisings into a centralized, nationwide revolution, and last not least, Bolshevik leaders of the Communist Party who are able and enough experienced to master armed uprisings in accordance with the guiding principles of Marxism-Leninism: The crucial question is generally: At a certain point and to a certain time, the revolutionary forces must succeed in dominating over the counter-revolutionary forces, otherwise uprisings are doomed to the defeat. In the light of the teachings of the 5 Classics of Marxism-Leninism, the world proletariat as a whole will draw lessons from the Chinese Revolution for the final victory of the socialist world revolution. The dialectics of the proletarian revolution is such that it is permanently developing up to a higher stage, from where it will be strong enough to transform all the former defeats into future victories. And the metropolies in China will not form an exception from this irrefutable law of class struggle. 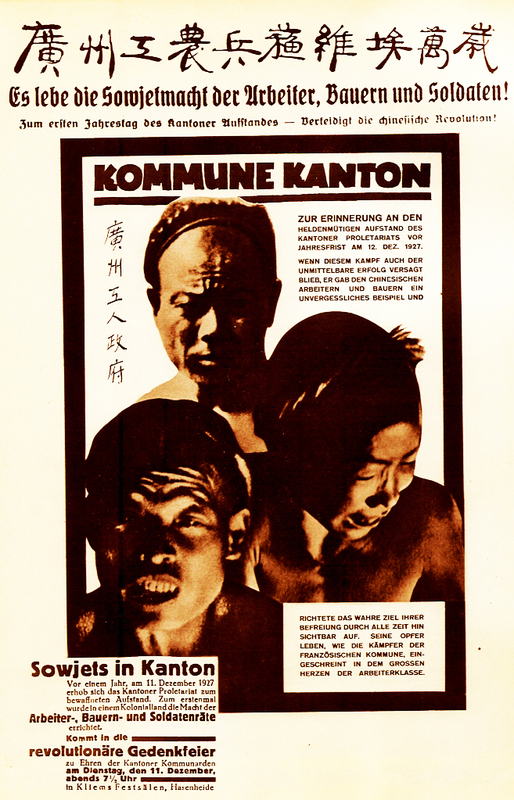 One day, inspired by the everlasting heroism of the proletariat in Kanton and Shanghai, the world proletariat and its Chinese detachment will make an end of exploitation and oppression all over the world. "As a matter of fact, the C.C., C.P.S.U.(B.) 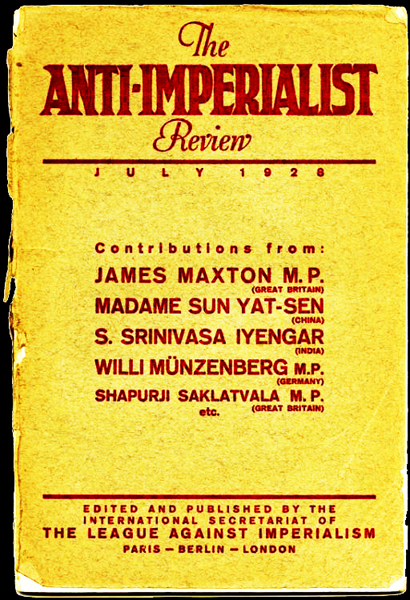 and the Comintern upheld not the policy of supporting the national bourgeoisie, but a policy of utilising the national bourgeoisie so long as the revolution in China was the revolution of an all-national united front, and they later replaced that policy by a policy of armed struggle against the national bourgeoisie when the revolution in China became an agrarian revolution, and the national bourgeoisie began to desert the revolution. a) the line of the Comintern, which takes into account the existence of feudal survivals in China, as the predominant form of oppression, the decisive importance of the powerful agrarian movement, the connection of the feudal survivals with imperialism, and the bourgeois-democratic character of the Chinese revolution with its struggle spearheaded against imperialism; the Communists must strengthen proletariat's role of hegemon in the Chinese bourgeois-democratic revolution, and to hasten the moment of transition to the proletarian revolution. 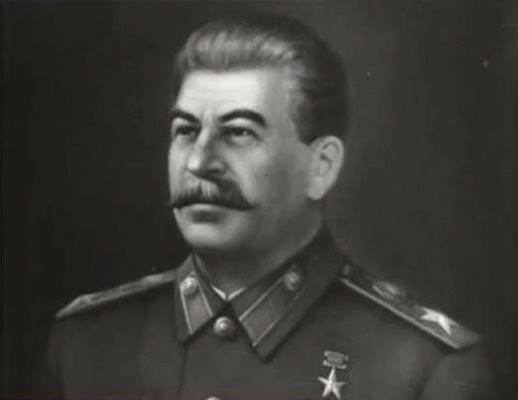 Today, the Chinese Stalinist-Hoxhaists defend bravely comrade Stalin, the leader of the socialist world revolution, against growing attacks of the Maoists. "We can say that, in general, the Communist Party of China did not properly carry out this role in this situation which had been created in China in a studied and systematic manner, seen from the angle of scientific socialism. On this question, there were different tendencies in that small party which called itself the Communist Party of China, tendencies which have never permitted a correct Marxist-Leninist line to be established, or Marxist-Leninist thought and action to guide it. 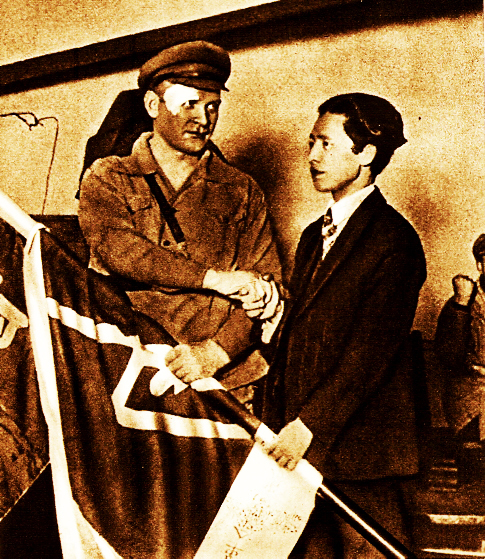 These initial tendencies which were displayed many times among the main leaders of the party, were frequently leftist, sometimes right-opportunist, sometimes centrist, going as far as anarchist, Trotskyite, bourgeois, and marked chauvinist and racist views. Even later, these tendencies remained as one of the distinctive characteristics of the Communist Party of China which Mao Tsetung and his group eventually led. 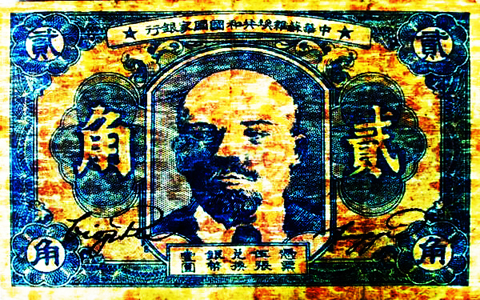 For this new party to have carried on a systematic, organized, studied and mature struggle in those very complicated situations, on such a large continent, on which the ideas of Confucius and the feudal order had left deep, not to say, indelible impressions, it was necessary that the Chinese communists should have had absolute faith in scientific Marxism, in Lenin and the Comintern, should have reported to them realistically about the situations in China, with the aim that the decisions which were taken by the Comintern about China should be correct and applied correctly by the Chinese communists. 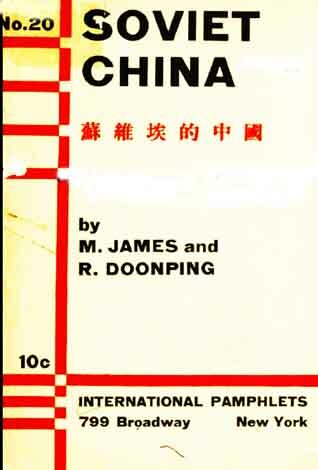 In my opinion, despite the good will of neophytes, these things were not achieved by the Communist Party of China; therefore I think that this is where all the vacillations to the left or to the right, from that time down to this day, have their source" ("Reflections on China", pages 768-769). 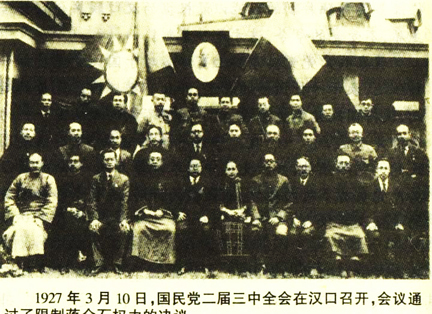 Indeed, it is an historical fact that the policy of the leadership of the CP China was opportunist in time of the bloc with the Kuomintang which, particularly, led to the defeat of the proletariat of Shanghai in March 1927. 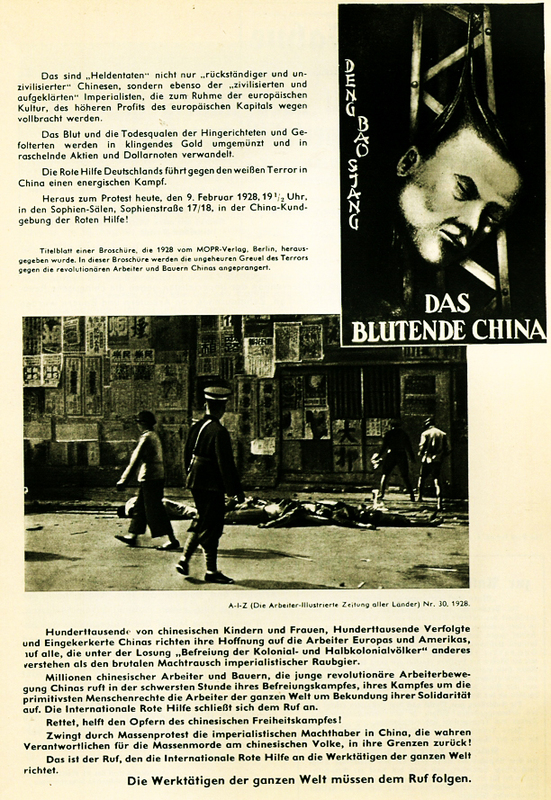 The CP of China did not follow the advice of the Comintern to stay in the bloc of the Kuomintang and simultaneously struggle independently for the proletarian hegemony in the democratic revolution and its transformation into the socialist revolution. Today, China is a social-imperialist, social-fascist super power which does not only exploit and oppress the own people but the peoples all over the world. 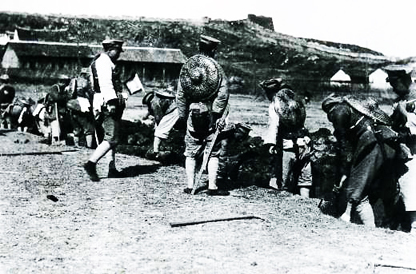 Drawing lessons of the Chinese Revolution 1925 – 1927 means to crown it with its completion, namely by the armed revolutionary overthrow of the Chinese imperialist bourgeoisie and the establishment of the dictatorship of the Chinese proletariat. 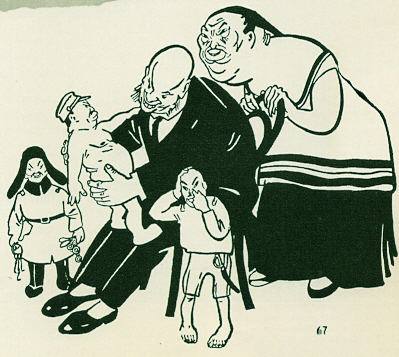 This is only possible by means of the leading role of the Chinese Section of the Comintern (SH) which is guided by the lessons of the 5 Classics of Marxism-Leninism, especially in its struggle for the destruction of the influence of bourgeois Maoist ideology within the working class and the toiling masses. The path of the socialist world revolution is stony and arduous. But the world proletariat will remove all obstacles out of the way. We are totally convinced that the victory of the socialist world revolution will be unavoidable if the Chinese proletariat, relying on its heroic revolutionary traditions of 1925-1927, will join the invincible world army of the proletariat. 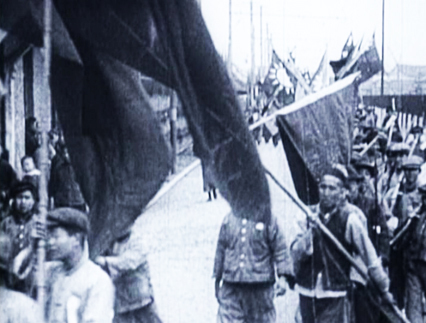 Long live the Chinese Revolution 1925 – 1927 ! Long live the dictatorship of the Chinese proletariat ! Long live the armed socialist (anti-Maoist) revolution in China ! Long live the violent socialist, proletarian world revolution ! Long live the socialist China in a socialist world ! 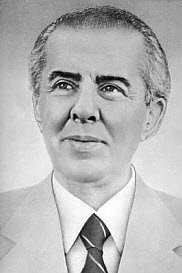 Long live the teachings of the 5 Classics of Marxism-Leninism: Marx, Engels, Lenin, Stalin and Enver Hoxha ! Long live the Comintern (SH) and its Chinese Section ! 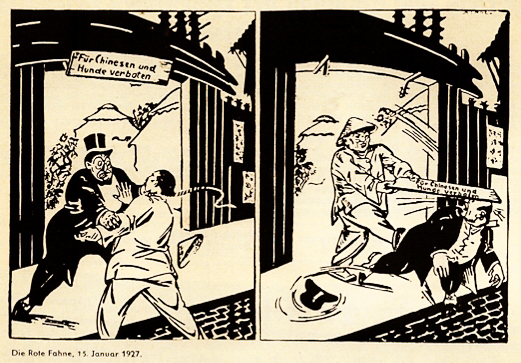 On the occasion of the 90th anniversary of the uprising of Shanghai, on 23 October 1926, the Comintern (SH) sends you militant greetings of proletarian internationalism. 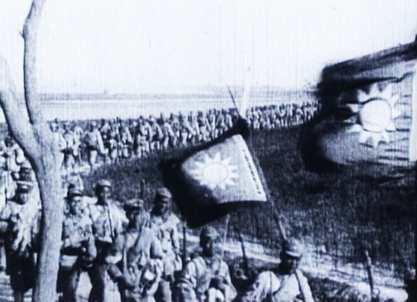 On this day, we commemorate all Chinese comrades who have sacrificed their lives in the uprising of Shanghai. 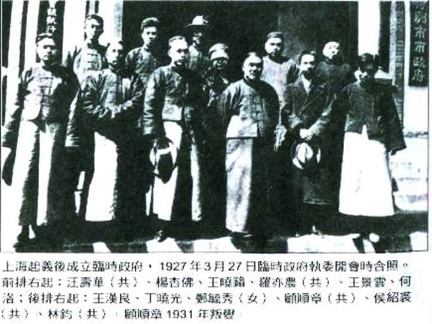 At that time, the Communist Party of China, according to correct instructions from the Comintern Decisions, was in a block relationship with the Kuomintang to carry out a joint struggle against feudalist and semi-feudalist militarism as well as against foreign imperialism. 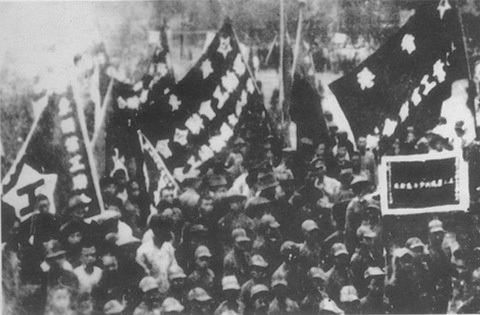 The uprising of 23 October 1926 was the first insurrection in Shanghai. 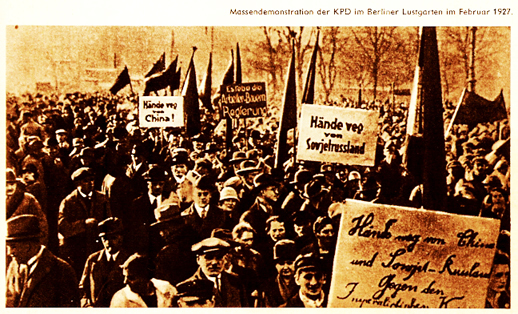 The second insurrection followed on 22 February 1927. And the third insurrection began March 21, 1927. 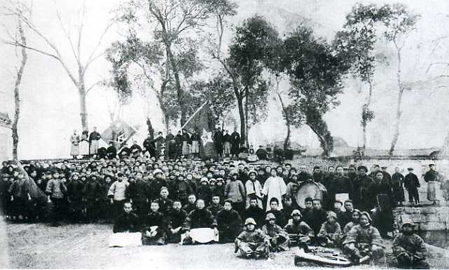 In all three revolutions of Shanghai, the focus was on the tactics of combining the revolutionary actions in the rear of the enemy troops and the simultaneous advance of the national revolutionary army. In the first two revolts, the national bourgeoisie was still in the camp of the bourgeois-democratic revolution, while it was already in the camp of reaction during the Third Uprising. 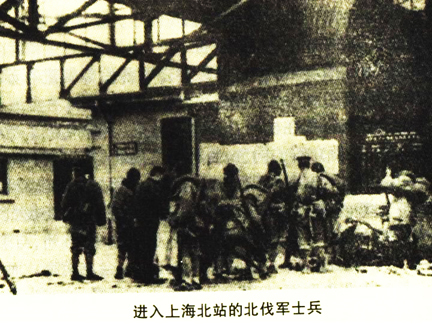 During the first Shanghai Uprising, there were only a few small clashes between individual detachments of the fighting-organizations and the police. How could this happen? This was by no means due to the lack of influence of the CPC. It gained considerable success at the front. The decisive layers of the proletariat of Shanghai were quite ready for the general strike and insurrection. The insurrection was to start with the seafarer's strike, then the metalworker and workers of the water and electricity works, and finally the textile workers. A total of almost 100,000 strike-ready workers were expected. 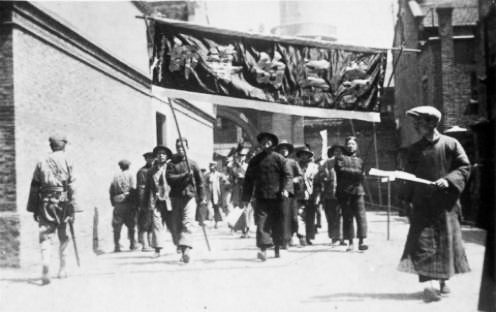 The workers in Shanghai were opposed by the reactionary troops of Sun Tchuan-fang: 1 battalion infantry (about 1000 soldiers), 2,000 policemen, and the brigade of General Li Bao-chang, which was not far away on the north bank of the Yangtze. 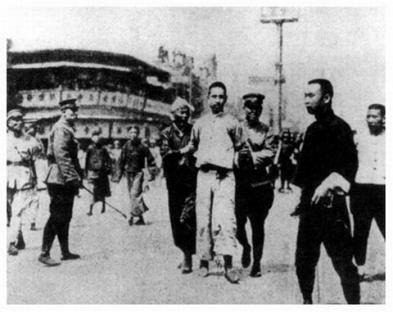 The Chinese Communist Party set up armed detachments of 130 workers, but they had no weapons. 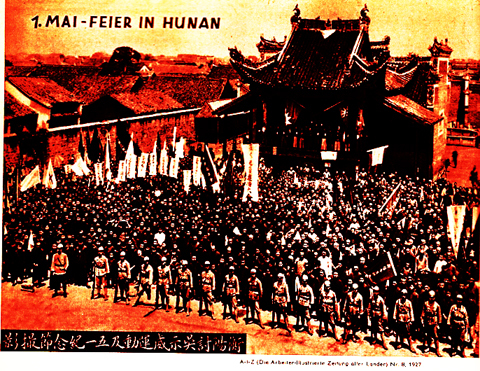 At the same time, the Kuomintang did not make much more men into a militia. There was not even a rebellion plan. Nor could one agree on a joint leadership of the insurrection, so that it was only carried out separately. The signal for starting should be output by a cannon shot. But this cannon shot was not fired. Therefore, the insurrection, wioth the exception of a few small clashes with the police, did not occur at all. Thus, the CPC postponed the insurrection on the 24th of October. The Chinese Communist Party had renounced an independent policy in the imminent armed insurrection. The main reason for the failure of the insurrection was, of course, not the absent signal of the cannon shot. 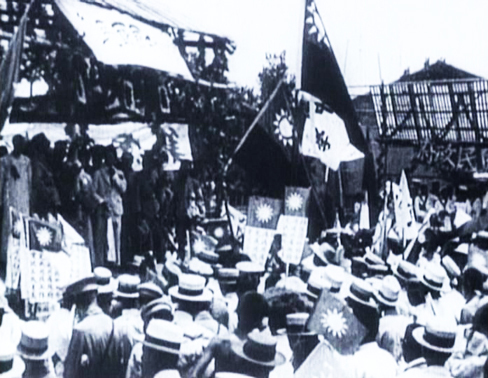 The main reason is rather to be found in the wrong tactics of the Chinese Communist Party, which at that time had too much convidence in the Kuomintang, and relinquished the leadership of the uprising to the Kuomintang, which had also determined the date of the insurrection. 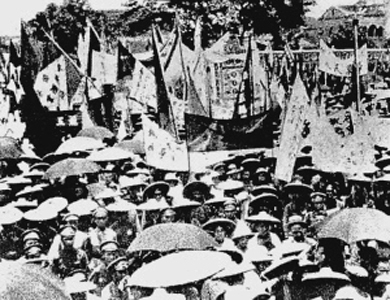 The Chinese Communist Party had begun to prepare and carry out the uprising in the wake of the Kuomintang. 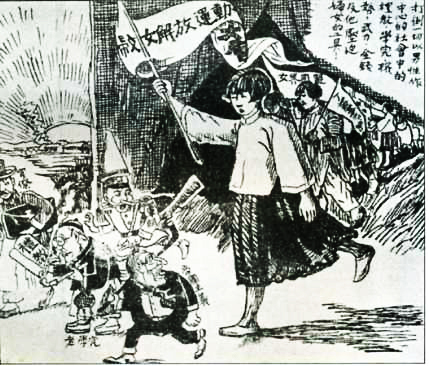 The chief mistake of the Communist Party of China was that the Shanghai proletariat was not sufficiently prepared for the insurrection, let alone put at the head of the insurrection. 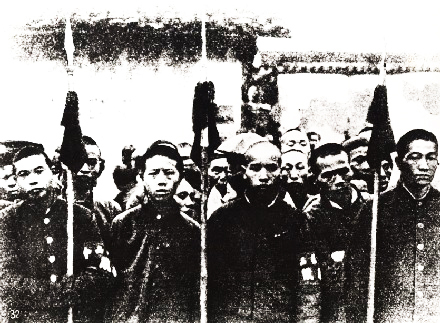 Even in the case of the deficient preparation by the CPC, the revolutionary actions of the proletariat could have decided the victorious outcome of the insurrection. But the CPC had underestimated the power of the proletariat and at the same time overestimated the meaning of purely military action. Proletarian strikes were subordinated to purely military action. Thus, with the premature failure of military action, no strikes of the workers came about. Furthermore, no provisions were made for a retreat in the possible case of a defeat. 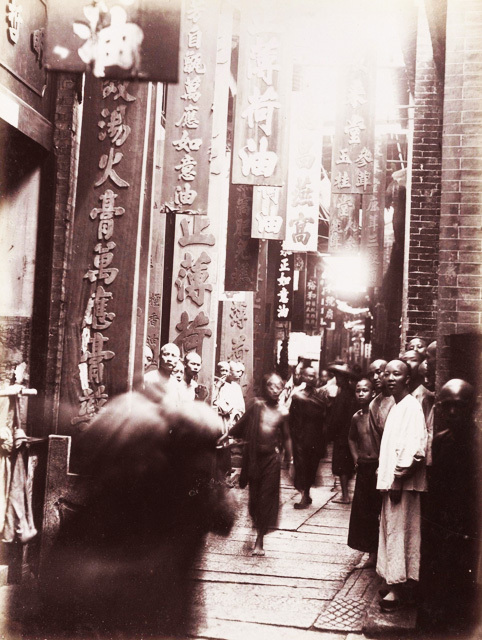 The causes of the unsuccessful revolt in Shanghai were, firstly, the fundamental wrong tactics of the Chinese Communist Party against the Kuomintang, and second, the underprediction of the role of the proletariat in the revolution. 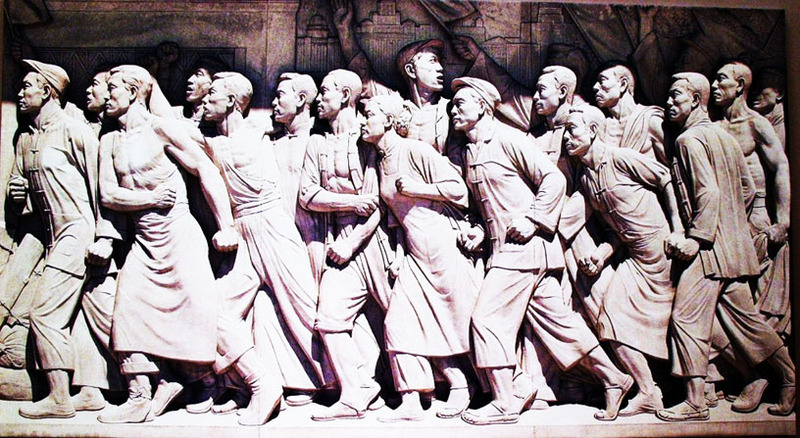 In words, the leading role of the proletariat in the revolution has always been emphasized, but in practice the Chinese Communist Party was not concerned. 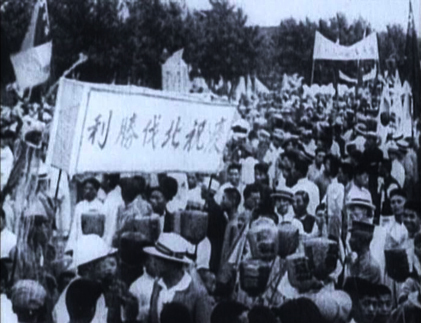 Thus, the Chinese Communist Party did not fulfill its policy as an avant-garde of the proletariat, but marched along the line of the Kuomintang. In the bourgeois-democratic revolution the proletariat and its communist party must have the lead, not the national bourgeoisie with its Kuomintang. If this principle is not taken into consideration, the bourgeois-democratic revolution is doomed to failure. The bourgeois-democratic revolution can be accomplished and guaranteed only by the power of the workers and peasants, by the transition into the proletarian revolution. This was the line of the Comintern of Lenin and Stalin, which the Chinese Communist Party had not followed. And so the defeat of the Shanghai Uprising could not be a surprise. It was inevitable. The Chinese Communist Party trusted too much in the Kuomintang, without taking into account that one day the bourgeoisie would betray the revolution and change into the camp of reaction. 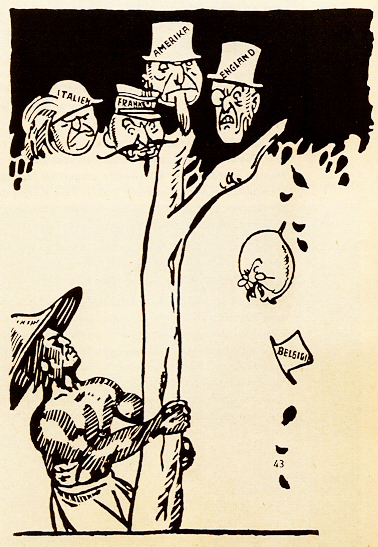 It was only in August 1927 that the opportunist leadership of the CPC was abandoned. 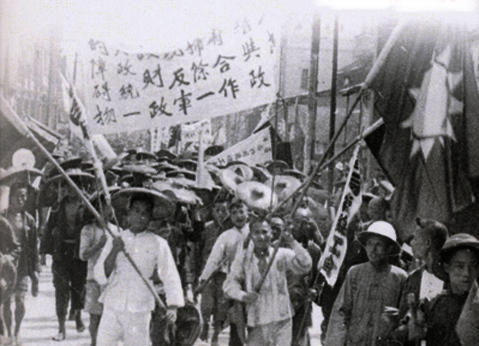 The teachings of the uprising of Shanghai, 23 October 1926, that is to crown its victory today by the armed revolutionary overthrow of the Chinese imperialist bourgeoisie and the establishment of the dictatorship of the Chinese proletariat. Long live the uprising of Shanghai! Long live the Shanghai proletariat! Long live the proletarian revolution in China and around the world! Long live the Comintern (SH) and the construction of her Section in China! "Can the Chinese Revolution be called proletarian revolution"
(remark: only for historical studies !